Former Australian PM Kevin Rudd has accused Israeli leader Benjamin Netanyahu of "torpedoing" peace negotiations in the Middle East. The first Israeli PM to visit Australia, Mr Netanyahu had earlier criticised Mr Rudd for saying Australia should recognise a Palestinian state. In a scathing Facebook post, Mr Rudd said the Israeli leader sabotaged US peace talks "by changing the goalposts" often at "five minutes to midnight". Mr Netanyahu has yet to respond. But he dismissed Mr Rudd's earlier call for Australia to recognise a Palestinian state, saying it would be a state that "calls for Israel's destruction". The Israeli leader is in the middle of a four-day visit to Australia, with current Prime Minister Malcolm Turnbull as his host. Mr Turnbull called Israel a "miraculous nation" in a warm meeting with Mr Netanyahu on Wednesday. 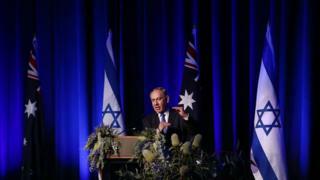 Mr Netanyahu thanked Australia for defending his nation against UN resolutions. The tone struck by Mr Rudd in his Facebook post was a marked contrast. Mr Rudd said he was a life-long supporter of Israel and had publicly campaigned against anti-Semitism. But he added that "to support the state of Israel does not mandate automatic support for each and every policy of Mr Netanyahu". "The boundaries, internal security, external security, public finance and governance of a Palestinian state have been elaborated in detail in multiple negotiations with the US under the Clinton, Bush and Obama Administrations, most recently in the Kerry Plan," Mr Rudd wrote. "Mr Netanyahu knows these formulations like the back of his hand. Mr Netanyahu also knows he has torpedoed each of them, often at five minutes to midnight, often by changing the goalposts, to the enduring frustration of both Republican and Democrat Administrations." The former prime minister also referred to a diplomatic incident in 2010 where four forged Australian passports were used in the murder of a Hamas operative in Dubai. Mr Rudd's government expelled an Israeli diplomat over the affair. "No apology has ever been received for that action," he said. A rally protesting against the Mr Netanyahu's visit is expected to be held in Sydney on Thursday night.